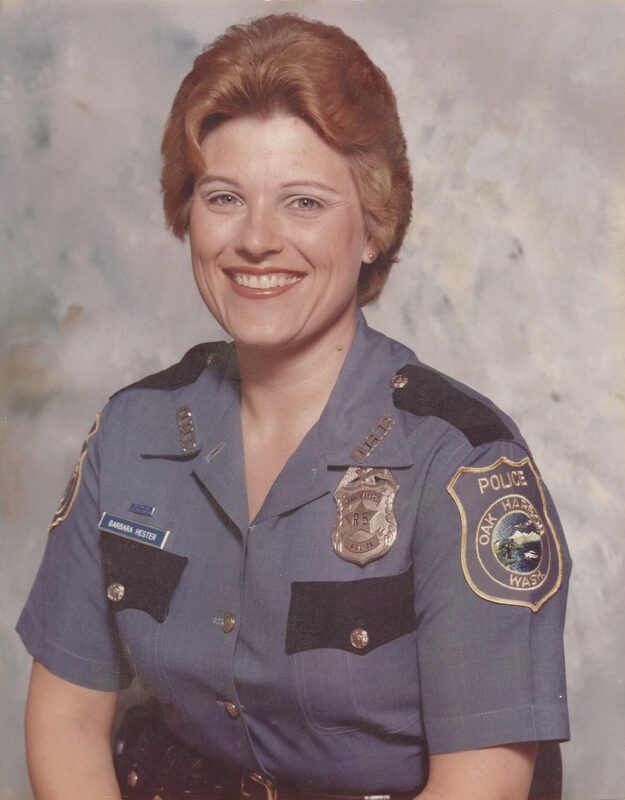 Reader spotlight: Meet Barb Jamison, former badass undercover cop and first female officer hired in her city. It’s always amazing to meet (and get to know) these people who I would have never met otherwise, so I’m always so excited when someone reaches out to me. With all that being said, I wanted to highlight an amazing reader/lady, who I came across probably six months ago and have become (dare I say?) friends with. Enough of a preamble. Let’s get down to the good stuff. Me: How did you hear about me as an author? Me: What do you appreciate about my books/writing? Me: What in the world made you decide to become a police officer? Barb: “When we were stationed in Japan, I wanted to start college courses. I wasn’t sure what to major in. A guy I knew that was in Security on base said he was teaching a class in Criminal Law at the College (University of Maryland Overseas) and said, “Take my class, you will really like it but if you don’t, you can use it as an elective until you decide on a major.” I did and decided on Criminal Justice Major. The rest is history. 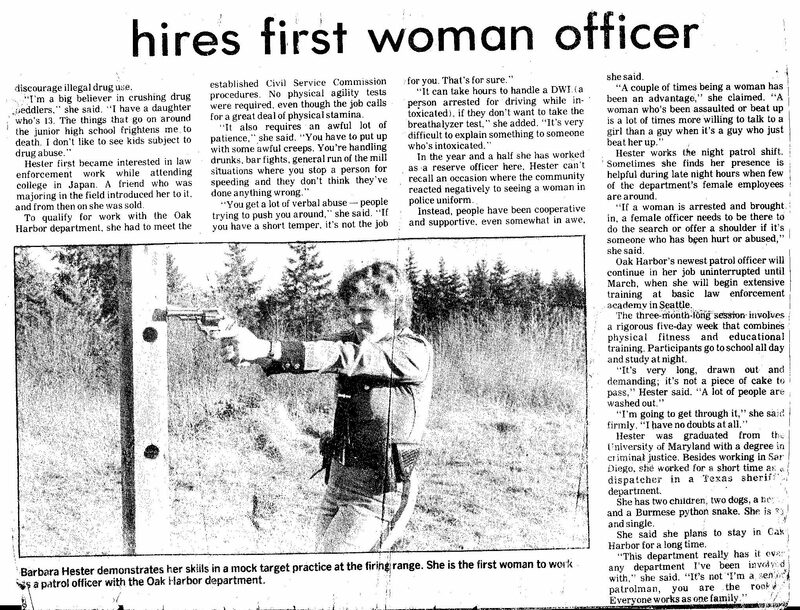 “I finished in Washington State while working as a reserve police officer and in less than a year was hired full time by the PD. Four years later I was hijacked from the city PD by the county sheriff and was a deputy from then on. It wasn’t the lame desire to “help people,” which I did, but mostly because I love to solve a puzzle — especially if that puzzle is a crime scene. Me: Since we’ve exchanged several emails, what have you found most surprising in talking to me? Barb: “That is an easy one for me. In talking to you, I have come to realize that authors are people, too. They have thoughts, feelings, good days, bad days and days that the brain just can’t focus on writing, not to mention authors have other interests besides writing. And you are willing to share those with friends. Also, I’ve learned all writers have families who sacrifice time with them so they can write great stuff for us readers. I love that you have shared your Marine Corps service with us. Me: Let’s talk some more about your police work. What was the coolest thing you did as a cop? “He showed me a huge brick of marijuana and said, “Do you have money for this?” and I showed him a banded stack of $100 bills. We both reached out the window of our cars and traded his brick and my cash. He pulled out first while I was looking busy in my car, then I followed at a distance. Little did he know that my two-man back up car was hidden in the woods near the road and followed him as well. I stayed way behind and when I saw the pull him over, I pulled to the shoulder a quarter mile back, lights off. After they pulled him out of his car and put him in the back of the patrol car, I let them take off, then I did as well, staying way back. Me : What was the scariest thing that ever happened to you as a cop? Barb: “There was an area in our county called “Possession Point,” and it was ripe with Witchcraft and Satanic activity. It was just a scary place, mostly wooded. We were sent to a complaint a man called in, that his wife had gone insane. Four cars from various agencies, as well as myself, got there and connected with the husband outside a trailer that sat by itself in the woods. Husband said, “I’m getting the hell out of here!” and he left in his car. 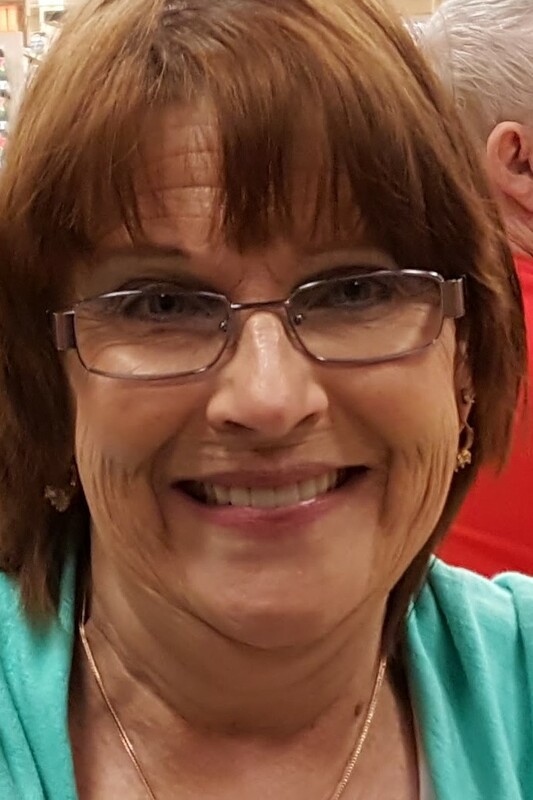 “We hadn’t seen the wife yet so we went up onto the porch, guns drawn, and peeked in living room window and saw Marie feeding $100 bills into a pot belly furnace along with any other paper she could find. The chimney stack that went out the roof was red, it was so hot from all the burning paper. We saw her reach out, grab the smoke stack with her bare hands lift it off of the furnace and pitched it onto the floor which immediately lit up the rug and curtains and a lounge chair. “Something inside the trailer exploded and blew all four of us and Marie out the door and onto the surrounding deck. By then an ambulance and fire truck had arrived. “How in the hell did she (under sedative) manage to unlock 4 straps down her body, holding her on the gurney? It took six of us to get her on the ground and sit on her while medics gave her more sedation. Then we were finally able to get her in and head to the hospital. We, all eleven of us, just stood there, looking bewildered. Me: Wow! lol. That’s probably the craziest, scariest story I ever heard. And it’s the kind of story that had there been no witnesses, no one would ever even believe you. What is the one myth about cops that’s completely wrong and drives you the most crazy? 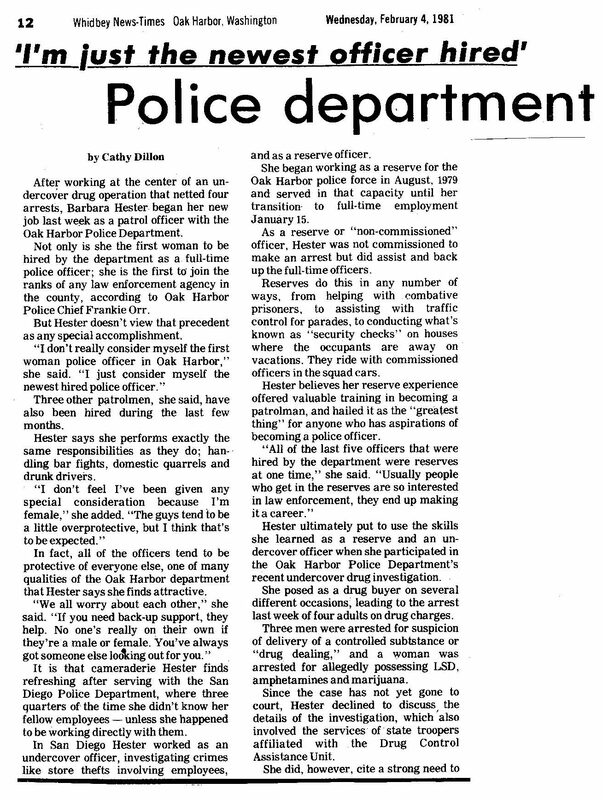 Barb: “I have heard this dozens of times, “Cops have the best stash!” Like anyone in a police uniform, that takes drugs away from someone “for evidence,” but some think the cops put the drugs in their own pockets. Maybe a few do. It’s a big country with lots of cops. Most of them love their jobs and want to get drugs off the street and put the pushers and suppliers behind bars. You need the evidence to do that in court to support your arrest reports. Me: What are a few pieces of advice you’d have loved to have known when you were younger? Me: Thanks so much for doing the interview, Barb! It’s been great getting to know you through our emails, and I really appreciate how supportive you’ve been of my writing! One of my favorite authors died yesterday. Not only did “Watership Down” inspire me to have rabbits as a kid, I also bought two rabbit bookends a few years back because of the book. Yeah, it’s kind of sick how obsessed I am with that book. I hate to hear he’s died… 😦 And I think it’s every author’s wish that we could write a book that makes such an impact. 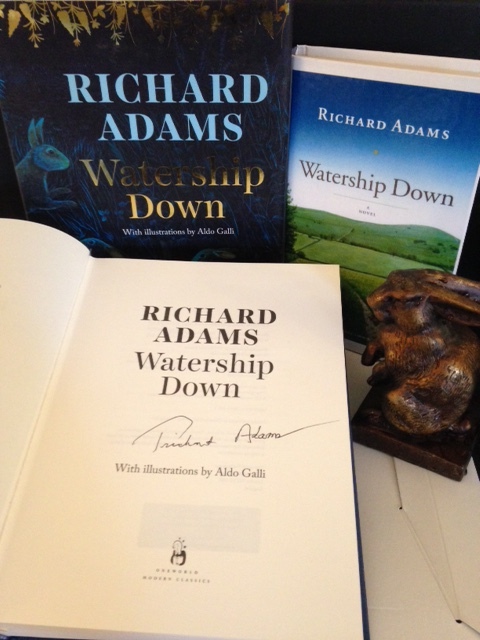 A photo of my signed book, other copies, and one of the bookends that I had to buy (and now treasure a little too much). One final thing to add, as if all the above isn’t bad enough… Danah often calls me her “bunny goat,” because I’m infatuated with rabbits and also as stubborn and hard-headed as a goat. Honestly, the nickname is pretty accurate. I mean, I’m just crazy about rabbits. I’ll be driving and constantly scanning the yards around my home for them. And when I see them, I often pull over and just watch them. Or shoot a quick video on my phone. Sorry, guys. I’ve rattled on too long, which is the classic sign of a writer who’s too close to something. But, clearly, I’m too close to this topic. If you’ve never read the book, check it out. And if you have kids in about seventh or eighth grade, and especially if they hate reading, hand them a copy of this book. It’s probably the primary childhood book that completely hooked me on reading as much as I did. Oh, and if you’re an adult, I think the book will blow you away as well. It’s that good.